Amazon is continuing its push into bricks-and-mortar retail. This time with a new store in New York. Called Amazon 4-star, the new store will sell a selection of bestselling products, all of which have a rating of 4 stars or above on Amazon.com. 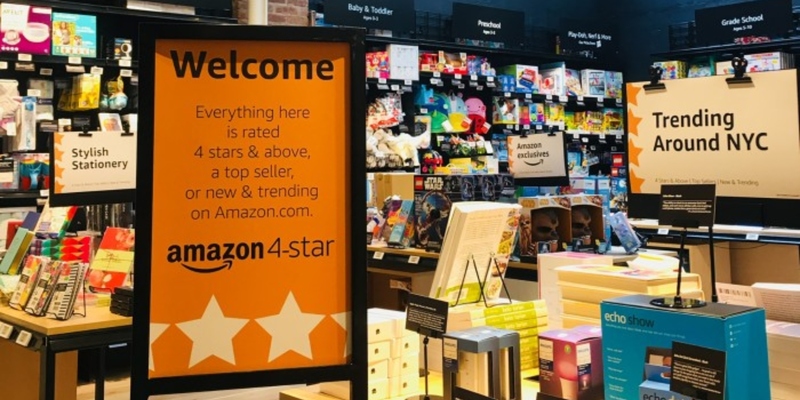 The first Amazon 4-star store opened today in New York. As the name suggests, everything sold in store is “rated 4 stars and above, is a top seller, or is new and trending on Amazon.com”. This is, in essence Amazon.com curated for a smaller retail space. The products on sale include “devices, consumer electronics, kitchen, home, toys, books, and games”. In a post on the Amazon Blog, Amazon suggests the selection is “a direct reflection of our customers—what they’re buying and what they’re loving”. Amazon has tried to bring some elements of the website through to its retail space. So there are products grouped as “Most-Wished-For” and “Frequently Bought Together”. There are also review cards with actual quotes from Amazon customers. Interestingly, each product has two price tags; the list price and the Prime price. The latter is the same price you’d pay buying online, but it’s only available to Prime subscribers. So even in its retail spaces Amazon is giving people a reason to sign up for Prime. This is Amazon pushing hard into the physical retail space. Like it or not, Amazon has forced many retailers out of business, and now Amazon is literally moving into the stores those retailers have abandoned. As Alanis Morissette once sang, “Isn’t it ironic”. While Amazon stores are clearly destined to become a common sight in cities, for the time being at least most of us will continue to shop on Amazon’s websites. So, with that in mind, you should check out our exhaustive guide to shopping on Amazon.